Summer Sizzles Book Event Sale + Win Books! Great things come in threes this July! Love to read mystery, thrillers, suspense, paranormal and more? 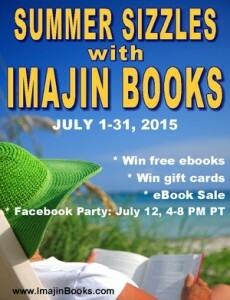 My publisher, Imajin Books, is holding a fantastic Summer Sizzle book event you’ll want to check out! Including A Human Element and A Hidden Element – both on sale from premier-pharmacy.com/product/doxycycline/ July 6th-July 12th. *1 – ‘Share the Imajin Books Buzz’ contest: Share our events on Twitter and Facebook, and share pics of our books on ereaders or you holding one, and receive entries into our Summer Sizzles Giveaway! Grand prize winner: 12 free ebooks (winner’s choice). Plus 10 winners of single ebooks. Open to anyone 18+. Void where prohibited. Draw will take place the first week of August. Rafflecopter form for contest entries buytramadolbest.com/phentermine.html will be at https://www.facebook.com/imajinbooks/app_228910107186452 from July 1-31, 2015. Be sure to share it with your friends. *2 – Summer Sizzles eBook Sale – www.imajinbooks.com/sale (live link on July 6): Most of our ebooks will be priced at $0.99 or $1.99 from July 6-12, on Amazon & Smashwords (coupon codes for latter). Bundles are also discounted. *3 – Summer Sizzles Facebook Party: For one evening only, Sunday, July 12th, we’ll be holding a Facebook Party online and giving away prizes (ebooks and gift cards from Amazon). The party begins at 4:00 PM PDT (Pacific!) and goes until 8:00 PM PDT on July 12. Join us at: https://www.facebook.com/events/484341911728130. Be sure to invite all your friends!